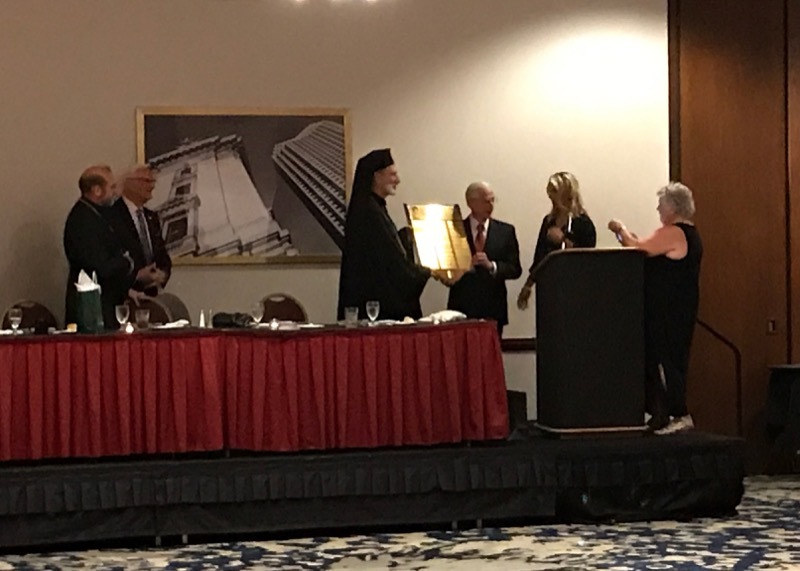 On Friday, June 9th, International Orthodox Christian Charities (IOCC) celebrated their 25th anniversary with a gala event near Cleveland, Ohio. The evening began with a cocktail hour featuring entertainment by “Sarena”, a local tamburitza orchestra. In a pleasant atmosphere over drinks and appetizers, guests were able to enjoy fellowship with Orthodox Christians from multiple jurisdictions, united to serve God in service to others. The event formally began with a welcome by the master of ceremonies, Mr. Michael Herzak, chairman of the Board of Trustee of St Tikhon’s Orthodox Seminary. He offered a warm welcome to all those gathered together, and presented the Diane Zamiska (the late sister of Bishop Irinej) Award for support of IOCC to an individual who was not only instrumental in the founding years of the organization, but who had been an ardent supporter and articulate voice for the mission of IOCC since its inception: the evening’s featured speaker, His Grace Bishop Irinej of the Eastern-American Diocese of the Serbian Orthodox Church. Following the presentation of the Diane Zamiska award to Bishop Irinej, the first speaker of the evening, Dean Triantafilou, Executive Director of IOCC, came to the podium. He related the impact that the organization had had on his life, and offered the tremendous support and influence that Bishop Irinej had on both his personal growth, and that of IOCC. The event continued with Alex Machaskee, former president of the Cleveland Plain Dealer and current executive board chair at St. Vladimir’s Orthodox Theological Seminary, who introduced the evening’s keynote speaker, His Grace Bishop Irinej. Mr. Machaskee offered a brief biography of His Grace Irinej, a Cleveland native, while at the same time weaving His Grace’s biographical narrative into the growth and development of IOCC. His Grace Irinej followed, offering a powerful oration on the impact of IOCC throughout the world. Throughout his remarks, His Grace continually brought the large-scale work of IOCC down to its impactful, human level. Quoting St. Nicholai Velimirovich, His Grace Bishop Irinej relayed that the impressive skyscrapers of our spiritual life and work must have a firm foundation on a bedrock that runs deeper than even the human heart - a foundation of our true image in Jesus Christ. From that foundation, IOCC, and all those who support it, have been able to accomplish magnificent and life-changing humanitarian work throughout the globe. His Grace Bishop Irinej also spoke to the pan-Orthodox nature of the organization. He recounted a story of Bishop Lavrentije, the longest serving Bishop in the Serbian Orthodox Church, who was on the back of a truck handing out sacks of flour to those in need during a humanitarian crisis in Serbia. A little old woman approached the truck, frail but willing to carry the heavy flour out of her desperate need, and proceeded to thank Bishop Lavrentije. He shared with her that the flour came from Greeks, Russians, Serbians, Antiochians, Romanians and so many other Orthodox Jurisdictions and Christians throughout the world. The old woman marveled that it was not only her Serbian people from America offering their love and support, but that her entire Orthodox Christian family extended their love and care to her. His Grace Bishop Irinej thanked those in attendance, and all those who support IOCC for its ongoing and important work. He mentioned that IOCC, more than providing needed goods, provides joy and human dignity to those who find themselves in hopeless and dire situations. The gala event was not only a successful fundraiser, but an inspiring reminder of the tremendous work of IOCC - and the power of Jesus Christ manifest in Orthodox Christians working together, as one, in common cause. IOCC is an international charitable organization that has donated more than $600 million in worldwide relief and development programs. Approximately 92% of all money donated directly helps those facing dire situations, and every dollar given secures approximately $7 in support from various sources. They have helped people in more than 50 countries on 6 continents. Help IOCC today by visiting their website and offering your support!